Having a basic knowledge of Music Theory can really help you understand, appreciate, and enjoy music to the fullest. Whether you want to be thoroughly ready for your Freshman year in a music college, or if you just want to reach a new level in understanding the basics of music, you've found the right place to learn. You'll learn everything you need to know (pitch, rhythm, harmony, form, etc). Knowing that each student learns differently, I love figuring out someone's learning style and customizing the lessons for them. I like to break down concepts in their simplest forms so that there is no room for confusion whatsoever. I "turn over every stone" so that Music Theory students can gain a mastery of the basics of music. Hello! My name is Kevin, and I am looking forward to teaching you everything I know about music! I've been singing at Walt Disney World for over 23 years (and I still am currently) with the Voices of Liberty, the Dapper Dans of Main Street, and Four For A Dollar. I have a Bachelor of Science in Music Education from Penn State University. Even more than singing, playing the guitar, arranging for a cappella, and playing piano, I love to teach! Ever since I was a sophomore in high school, I've wanted to be a teacher of music in various capacities. My favorite aspect of teaching several private students each week is that every individual student has a different story: What is it that you want to accomplish? Would you like to sing, play piano, or play guitar? Would you like training in music theory? Do you want to eventually have a career in music? Will this be a hobby for you? Whatever your goals are, I am excited to know your story. I produced, arranged, and sang in a Holiday show at Sea World Orlando with an a capella co-ed quartet called "The Jingle Belles & Beaux". I had the opportunity to arrange vocal music for a cappella groups all around the globe with a company out of San Francisco called The Contemporary A Cappella Society. I created an all-male a cappella group within a music fraternity called Phi Mu Alpha at Penn State. They were called "The Dreamers". As they are still singing today, they have existed for over 25 years. They have produced more than four albums, sang for The President of the United States, toured at many high schools to inspire singers, and sang tens of thousands of singing Valentines over the years. Here I'm playing a little blues progression. I can start taking you this during your first lesson. Here I am singing at the American Gardens Theater at Epcot. 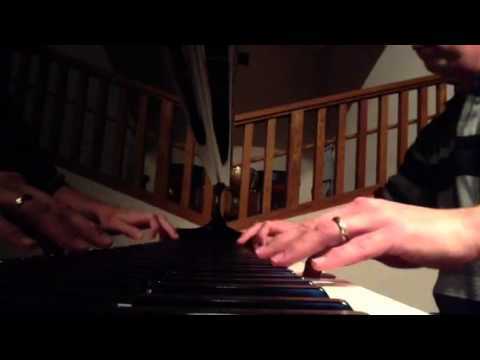 Here I am playing "Rhapsody In Blue" on a beautiful grand piano. 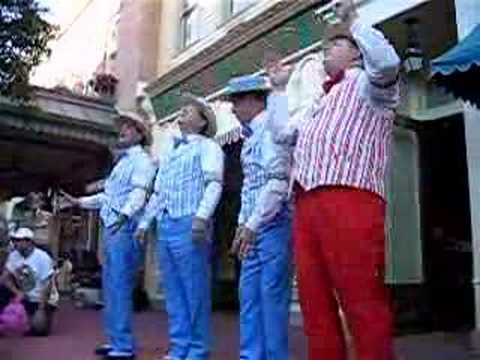 Here I am singing tenor with the Dapper Dans of Main Street USA at Walt Disney World's Magic Kingdom. 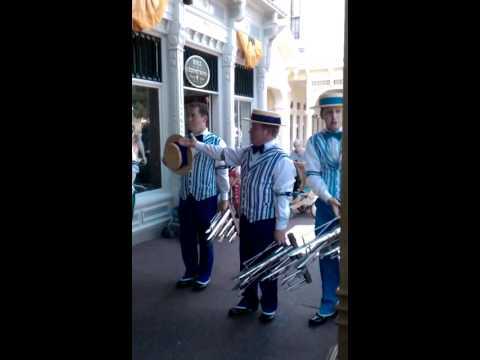 I'm singing lead here with The Dapper Dans of Main Street USA at Walt Disney World's Magic Kingdom. Just for fun (at Epcot). 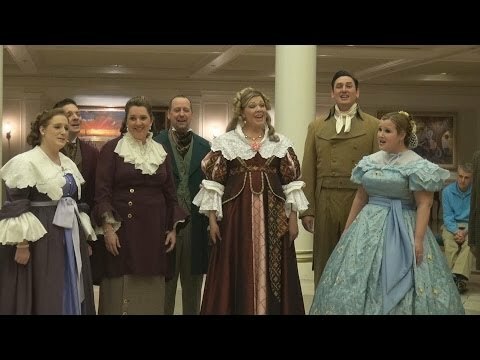 I'm wearing the green near the middle singing with The Voices of Liberty at Epcot. I've been singing with them since May of 1993. Singing tenor with The Dapper Dans at Disney. While singing in San Francisco, we ran into our friend, Jay Leno! Teaching piano to my neice. 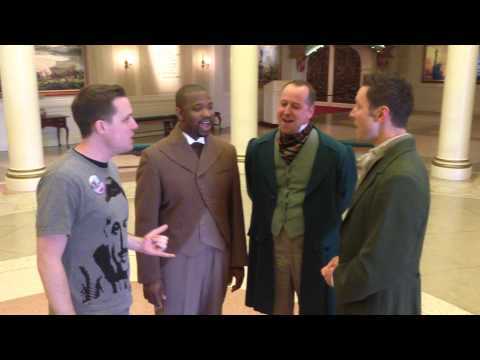 Singing a solo with The Voices of Liberty at Epcot. Singing baritone with The Humdingers in Brazil. Singing tenor with The Jingle Belles & Beaux @ Sea World Orlando. Posing with fans at Epcot. Singing tenor with The Cadaver Dans at Walt Disney World. Singing the National Anthem with The Liberty Voices for a Kansas City Chiefs vs Jacksonville Jaguars game. Great first lesson! Very knowledgeable and relatable- looking forward to watching my daughter grow in her vocal ability. Is So wonderful really good teacher nice I’m very happy !!! This was an amazing 1st lesson! I know that I will be playing with the band very soon. His ability to teach me the way that I need to learn was beyond exemplary! My family bought me lessons with Kevin as a gift and what an amazing gift it turned out to be. Kevin was fantastic and I really enjoyed the sessions. Excellent fund of music knowledge and skillful instruction! great experience, he has a lot of patience,. Very reasonable prices and took his time explaining everything so me and my children could all understand it before he moved on with the lesson. My daughter enjoy her first class so much, I am glad she liked the teacher and the class. We hope to keep coming to learn some more. My daughter had a great time with Kevin. He's professional, fun and very talented. Great teacher and I highly recommend him! I look forward to my lessons with Kevin every week. He is a talented teacher who cares to get the very best from his students. Over three months he has helped me with my confidence and widely expanded my knowledge of music and voice. If you are looking for a great music teacher, do yourself the favor of getting to know Kevin. Kevin gave the perfect lesson. He listened to my needs and my abilities as a student. He tailored instruction; he did not just start teaching me out of a book. If you want to get excited about your instrument of choice, Kevin will help that happen. Wonderful human being. You can't go wrong with this guy. Awesome Piano Lesson today! Kevin is great! Thank you! Kevin does a really great job working with me as a student. He is looking to help students realize their goals and is supportive at any level. He knows his stuff and is a great teacher. Highly recommended! My Daughter loved it and can't wait for her next lesson! She was nervous before going and shy in the begining but by the end of the lesson She told him he was the best! Enjoyed getting to know Kevin and his background better. We've formulated a way forward and I have homework. I'm very excited to get on and learn. Loving it. Thanks to his help, I enjoyed singing very much! He is very kind. I am not English speaker, so he tries to explain easier. I am looking forward to take next lesson!! He was very accommodating. Able to meet me at my home. Able to give me lessons from wherever I wanted to start. Overall, great experience. Looking forward to my next lesson with Kevin. She is learning a lot and really enjoys and looks forward to her lessons. Kevin has been a great teacher for our 11 year old daughter, Sophia. He has inspired her to learn and improve her vocal skills and she is now starting to learn some piano as well. He offers not just singing to her but a rounded understanding of her musical skills. After two months of weekly sessions, she is always excited to go to the class and to continue to practice at home, vocally and on the piano. Thanks Kevin! My daughter loves taking piano lessons with Mr. Kevin. He is extremely talented and knowledgeable and teaches in a way that is effective and fun. His excitement for music, use of technology, and ability to assess my daughter’s needs from lesson to lesson keeps her practicing and I appreciate his excellent communication about what and how she is doing. I would definitely recommend Mr. Kevin! My daughter really enjoyed Mr Kevin and we hope to continue lesson with him. Very knowledgable! Customized lesson for your level! Kevin is an amazing teacher! He has a gift for adapting to the level of the student and is extremely positive! He encourages his students and motivates them to keep working to accomplish their goals. Kevin is an amazing guitar instructor. As a 20 year elementary teacher, I see great teacher qualities in Kevin. He is not just teaching guitar skills, he is teaching learning strategies as well. He was honest on the type of guitar needed for my daughter to play with more success and is always enthusiastic and full of constructive suggestions. My daughter's eyes sparkle during her 30 minutes with Kevin. I also love the emails he sends to explain her lessons and what she is to practice at home. Is a inspirational and motivational instructor. He always provides excellent feedback and advice for my son. Kevin is a very creative and good instructor. He works with the student and family to prepare and implement an instruction plan that will help the student realize his or her goal. He is very accommodating and helpful in both the lessons and the public performance aspects. Kevin is enthusiastic and a great motivator! He explores more aspects of my son's interest to inspire him. My son has learned so much and has appreciated Kevin's suggestions and compliments regarding his ability. Kevin is an amazing instructor. He does a great job keeping my 5 year old interested in learning and always makes it exciting for her. She LOVES him! I highly recommend him. Kevin is such a great instructor. Not only does he do a fabulous job at vocal training and singing with my daughter he also is awesome at teaching her guitar and piano. Kevin's enthusiasm is what makes him a special teacher along with his patience. He is quiet outstanding. My daughter loves her lessons and looks forward to them weekly. I highly recommend Kevin! My 8 year old daughter has been taking piano and voice from Kevin for the past year. He is so patient with her and does such a great job of helping her understand what she is learning. She started with voice and showed such an interest in piano that he added that to her lessons. She has picked it up very quickly and looks forward to her lessons with Kevin. I would highly recommend him! My daughter,Kloe,has been taking lessons from Kevin since last year. She has never had any lessons before and was a beginner. Kevin has a passion for music and his students and it shows in his teaching. He is patient and lets the student learn at their own pace. He provides them with instruction on what to work on for the next lesson and any tools that may help with the student's progress. Kevin involves the parents on their child's achievements and sends weekly updates to the parents so they know what their child needs to focus on. I highly recommend Kevin !! !